Technology change and innovation are recognized as critical drivers to boost productivity, competitiveness, and economic growth in the global economy. Within the cocoa sector, these factors have huge potential to accelerate sustainability and raise cocoa farmers out of poverty. WCF is deepening its focus on technology change and innovation, and how we can better help member companies and origin governments develop stronger “innovation ecosystems.” To this end, the 2017 WCF Partnership Meeting on October 24-25, 2017, in Washington, D.C. will showcase opportunities, challenges, and good practices to spur “inclusive innovation” in the supply chain with the theme “Accelerating Sustainability through Technology and Innovation“. The biggest game-changers are at the farm level, where technologies like satellites, drones, and sensors are creating new opportunities for precision agriculture. Likewise, there are interesting advances to reducing cocoa production costs through mechanization, and improve cocoa flavor and quality through new approaches in fermentation and drying. Companies continue to pilot new service delivery models to improve the profitability of farmers and their integration into value chains. We read stories daily about the transformative potential of information and communication technologies for agriculture – WCF and member companies have already been piloting innovative mobile phone applications to deliver information about good farming practices, fertilizer usage, farm safety, labor practices, health, pest and disease prevention, post-harvest handling and crop marketing to cocoa farmers in Ghana. 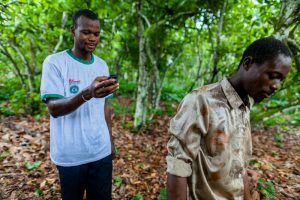 In West Africa, where land tenure remains a major barrier to sustainable farming, startups are pairing mobile phones with blockchain technology to track and verify land titles and deliver digital payments. 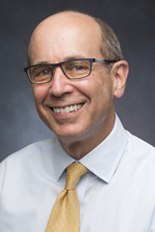 For processors and manufacturers, innovations in sourcing and processing offer new opportunities to increase supply chain efficiency, transparency and accountability. Smart image recognition technology may be able to grade beans on-farm, while smart containers can track batches of cocoa beans from farm to factory and ensure traceability. Many supply chain companies are leveraging new digital technology platforms to simplify supply chain data tracking and compliance monitoring. There are also many exciting innovations underway related to the cocoa and chocolate products themselves, including more flavors, healthier ingredients, portion size, and customization. In May, WCF spoke with SeaWeb, a sustainable seafood non-profit, to share cross-sector learnings and best practices about supply chain traceability and transparency. 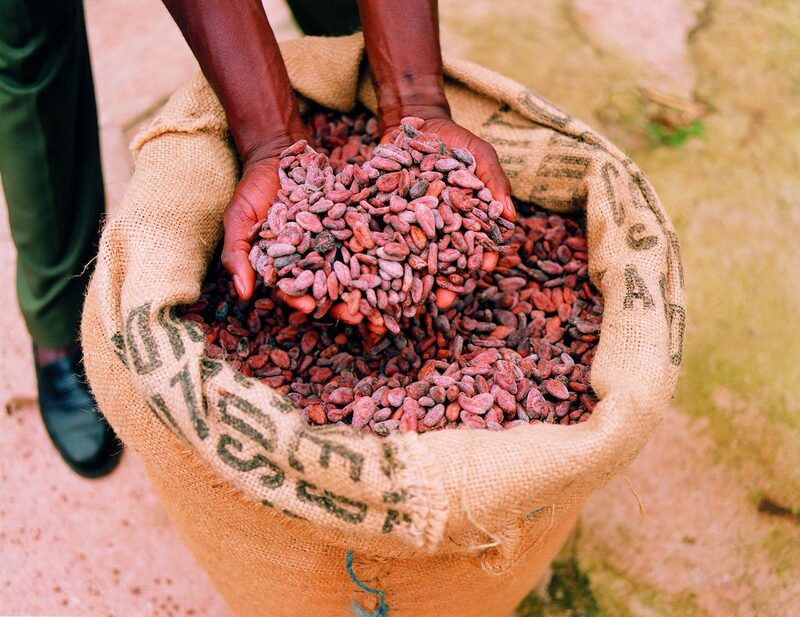 WCF’s Director of Monitoring & Evaluation, Jennifer Golden, shared with them why transparency is important in the cocoa sector and how WCF members are embedding transparency into their business models. SeaWeb (SW): What do you think is the future of traceability and transparency? Jennifer Golden: Before talking about traceability and transparency we need to differentiate the two. Traceability refers to tracing the product throughout the value supply chain; whereas transparency can relate to the sharing of all types of data and information – with respect to financial flows, sustainability practices, impact, and so on. There is a trend toward more of both which is driven by increased demand from companies throughout the value chain, consumers, civil society organizations, governments and other stakeholders. In terms of traceability one issue will continue to be the value-add of traceability as compared to the cost associated with tracing back from the chocolate bar up the value chain throughout the different touchpoints to the smallholder farmer. There are some innovations especially in technology that have potential to close this gap. SW: How does WCF think about traceability? Does WCF think about it mainly in terms of supply chain management, or as a way to communicate to the marketplace? Olam International, a WCF member, registered 100,000 smallholder farmers to Olam Farmer Information System (OFIS), a ‘one-stop’ tech platform for improved yield, traceability, and financial access. OFIS allows access to farm data and analysis to cooperatives, smallholders, and customers. For cooperatives, OFIS provides commercial management services to better manage stock, creditor, and debtor values. For smallholders, the system provides detailed farm mapping for support in individual farm management plans, text advice, and mobile payment wallets. For Olam International customers, OFIS improves the transparency of cocoa products through ‘geo-tagging’ and intervention insight which will reduce supply chain risk and improve funding efficiency. As part of Olam’s sustainability interventions under the Olam Livelihood Charter, OFIS can now give personalised farm development plans to each farmer with advice on how to make the most of each plot and crop. Over 10,000 have been generated for cocoa farmers. This advice, such as when and how to prune based on the exact age of the trees, can be texted straight to the farmer’s mobile phone. Having a plan empowers the farmer while progress against recommendations can be tracked over time, and adapted where necessary. They can also receive payments for their crops into a ‘mobile wallet’, allowing for the creation of credit histories and eventually bringing financial services to the rural disenfranchised. 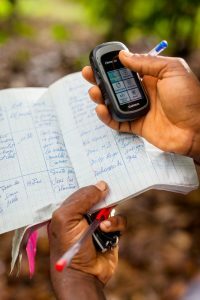 Each farm has been mapped and surveyed via an Android app with the uploaded data harnessed to provide tailored support for smallholders and more precise details to customers who need to make critical choices about financial interventions, such as agri-training, school or healthcare infrastructure. Currently, OFIS is being rolled out across Olam’s cashew, cocoa, coffee, hazelnuts, palm, pepper, rice and rubber supply chains, with a goal to reach half a million farmers by 2020. OFIS is in daily use in 21 separate countries including Brazil, Côte d’Ivoire, Ghana, Indonesia, Nicaragua, and Nigeria. active in the cocoa and chocolate value chain. 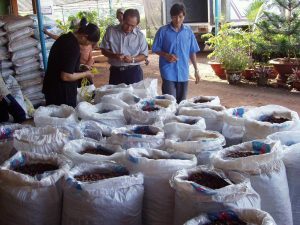 The program, funded in part from resources of the United States Government’s Feed the Future initiative, responded to the need for enhanced capacity in the cocoa sector within national institutions and addresses specific gaps in cocoa productivity improvements, including the provision of better planting materials, pesticides/fertilizers, and credit to cocoa farmers. poverty. The first is the fact that the productivity of cocoa farmers is very low, particularly in West Africa. The second is that there are many cocoa farmers without realistic alternative income options. As a result, these farmers continue to supply cocoa even at very low prices. While raising productivity can help individual cocoa farmers to earn a better income, this cannot be a sustainable solution for all farmers, as this would result in an oversupply of cocoa and an even lower cocoa price. The best solution is to create conditions that would allow cocoa farmers to earn alternative income sources and become less dependent on cocoa. • Strengthening the competitiveness of cocoa production and improving the income of cocoa producers in West and Central Africa, SÜDWIND e.V. This study has been commissioned by the German Federal Ministry of Economic Cooperation and Development (BMZ) in close cooperation with the four West and Central African cocoa producing countries to get a deeper insight into the huge challenges cocoa production and cocoa producers face regarding their livelihoods. The paper aims at analysing the global cocoa market’s structure and pricing mechanisms as well as the sector policies of the eight most important cocoa producing countries (Côte d’Ivoire, Ghana, Indonesia, Ecuador, Nigeria, Cameroon, Brazil, Peru) to identify measures that strengthen sustainability of cocoa production and improve livelihoods of producers. been put forward over the years. WCF is thrilled to welcome new member companies Idilia Foods, Nederland S.A., and Kookoo Pa Farmers Organization. WCF also welcomes Matthew Yinger (Finance Intern) and Scarlett Cinotti (Communications & Outreach Intern), Laura von Wahlde (Operations Associate), and Mihaele Alexe (MAP Associate/Temporary UX Volunteer) to the D.C. office, and bids a heartfelt thank you and farewell to Iain Edmundson (Learning and Strategy Intern) for his service to WCF.